Writing in his diary on Sunday, September 27th, 1869, William Henry Jackson explained that, “after his afternoon tea, he went to the depot to see the Western train come in and sell quite a few photographs.” Jackson, known as one of America’s most important nineteenth century photographers, documented the wilderness of the American West. Jackson started a successful business selling the photographs, maps, and paintings he produced during his time in the West to tourists and to those on the East Coast yearning to know what the unknown land of American enterprise, mountains, and gold looked like and contained. Jackson boarded on the Union Pacific Railroad in 1866 and made his way to the Omaha region, where he would settle and enter the photography business. Later, in 1869, Jackson won a commission from the Union Pacific Railroad Company and U.S. Geological Survey to document the scenery along their newly built railroads. The U.S. government wanted to chart the American West, speculate land, and identify eventual navigational routes for trade and urbanization. Jackson’s photography was thus based upon nineteenth century American notions of the Manifest Destiny: the widely-held belief that American settlers were destined to expand across North America. Deeply entrenched in this American desire to expand westward was a reliance on the caffeine found in tea. The men who worked for the Pacific Railway relied on tea as fuel for a long day of work. Although not as popular as coffee, tea gained prominence in the western United States due to Chinese immigrants bringing their tea drinking traditions while they built the railroads. In a locale with little access to food, tea became one of western railroad life’s necessities. 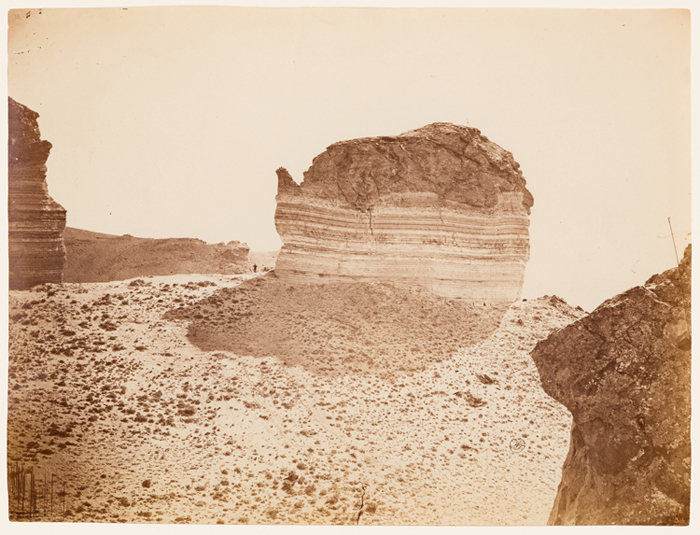 It is no surprise, then, why Jackson photographed the teapot-shaped boulder in 1869 (Figure 1). Near Green River, Wyoming, the boulder is single standing and appears to have a perfect teapot spout emerging from its side. The photo illustrates the now-famous boulder in bright sunlight, its outline perfectly highlighting the naturally formed teapot spout. While this natural oddity was probably not of utmost importance to the U.S. Geological Survey, the curious boulder would have garnered intrigue among Americans who were trying to imagine what the West looked like. Around the world in the Pacific Ocean, British and German expatriates were also evaluating, speculating, and excavating the bounty of natural resources that the new and mysterious land of Australia contained. One of the more important discoveries of this era were opal mines. While the opal mining industry did not gain prominence until the mid-twentieth century, the independent pioneers who brought shovels out to the various opal mining fields across Australia paved the way for one of Australia’s most important economies. The unique Boulder Opal Teapot rock (Figure 2) was mined from the Quilpie opal fields near Cunnamulla, Australia by local poet and opal miner Roy Sandford. 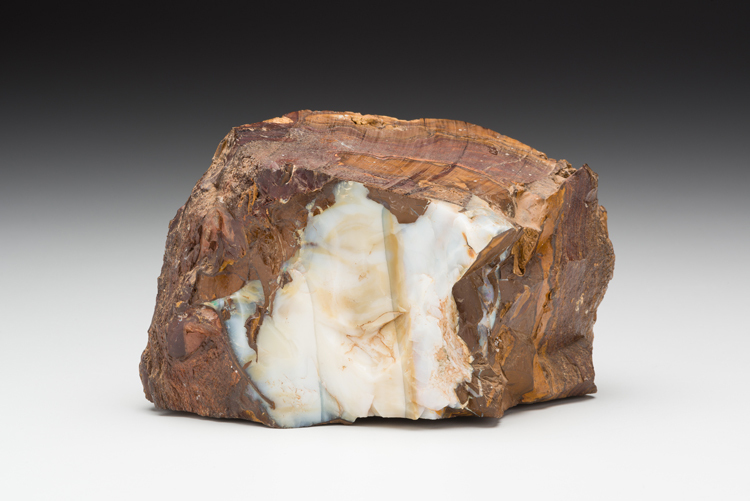 Boulder opal is often found embedded in large boulders of ironstone. The opal forms from pressure in the thin veins, fissures, and hollows common in ironstone. For this reason, boulder opal is found naturally in a variety of strange shapes. It is therefore entirely possible that the teapot-shaped opal formed naturally and organically. Australia was a British-occupied colony in the nineteenth century, so it comes as no surprise as to why an Australian poet from Cunnamulla found and preserved the geode currently in the Kamm Collection. Sandford was likely familiar with the shape of the teapot due to its popularity among British peoples throughout the eighteenth and nineteenth centuries. Like William Henry Jackson, the discoverer of this rock was likely fascinated that this newfound land could produce something naturally so alike and common to British society. As illustrated by these two examples, teapots and their surrounding culture can be analyzed from a variety of material angles. In looking at tea and geology in tandem, historical attitudes concerning the newfound lands, economic prosperity, and expansion can be revealed. The Kamm Teapot Collection is dedicated to understanding what the simple – yet incredibly significant and popular – form of the teapot can reveal about culture, history, and society. Hampton D. Smith is an undergraduate in the Art History department at the University of North Carolina, Chapel Hill. He is a former intern of the Kamm Teapot Foundation. William Henry Jackson Collection at Scotts Bluff National Monument. William Henry Jackson Photographs in the J. Paul Getty Museum Collection. Blair, Bob, ed. William Henry Jackson’s “The Pioneer Photographer”. Santa Fe: Museum of New Mexico Press, 2005.